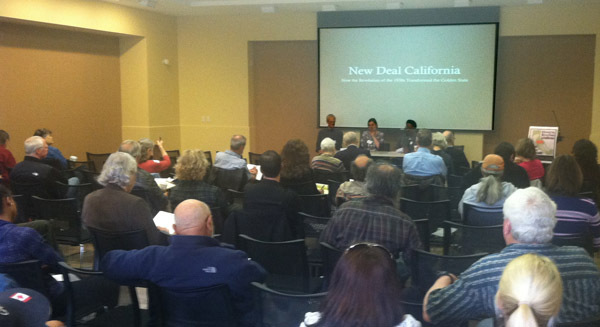 The 23rd annual California Studies conference, held 4/27/2013 at the David Brower Center in Berkeley, was a rousing success. Photos below show the panelists Keally McBride, Richard Walker, and Waldo Martin laying the historical groundwork for understanding our current political landscape; cartography panelist Chris Carlsson talking about the community-building role of Shaping San Francisco; and the Berkeley history walking tour guided by Richard Walker and Chuck Wollenberg. The Carey McWilliams Award for contribution to California scholarship was announced for USC professor Laura Pulido for her work on the People’s Guide to Los Angeles. Bill Issel, Professor of History at Mills College, will discuss his new book on Catholic political thought and activism in San Francisco. The talk, part of the UCB California Studies Dinner Seminar series, will be on Wednesday, May 15 from 7-9 p.m. at the UCB Institute for Research on Labor and Employment, 2521 Channing Way, Berkeley. Admission (including dinner) is free. This is a timed entry event. Reservations required. Join CHS guest curator Jon Christensen on a guided tour through the new CHS exhibition, Curating the Bay: Crowdsourcing a New Environmental History. Curating the Bay is a cultural and environmental history of the Bay, which includes over 200 objects, works of art and photographs from their collections, as well as the new crowdsourcing tool Historypin. Historypin allows visitors, either in person or online to contribute their own photos to CHS’ ever-evolving history of the Bay. 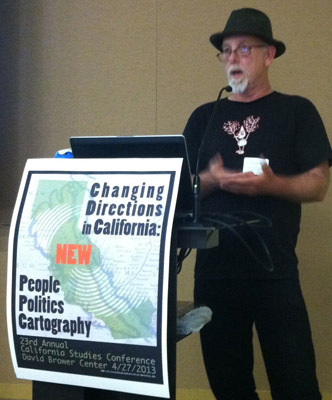 Jon Christensen, is the second CHS Curating California scholar-in-residence and adjunct assistant professor and Pritzker fellow at the Institute of the Environment and Sustainability and the Department of History at the University of California, Los Angeles. This op ed was written by the current chair of CSA but is not officially a position of that organization. Categories: Uncategorized | Tags: civil disobedience, Navy, peace, San Francisco Bay | Permalink.